We have two models of C frame hydraulic press for you to choose from, which are YTD30 and the YTD41. After the welding through the tempering aging treatment of metal, the machine body is rigid, reliable and resistant to deformation. The hydraulic system with artistic design is easy to operate. The oil pump is loaded with the independent filtrating device to ensure the service life of the oil pump and the valve. The slide four guide pillars guidance increases the product precision. The regulation and constant pressure are realized. The C-frame hydraulic press is used to stretch metal and make shapes. It is also applicable for processing the nonmetallic material and the powder metallurgic products. It is also utilized for reshaping and cutting edges for axis class components, crafts and other metallic materials. Additionally, the C-frame hydraulic press has an auxiliary worktable and photoelectricity protective device, also a touchscreen monitor and a PLC programmable control system to users' convenience. 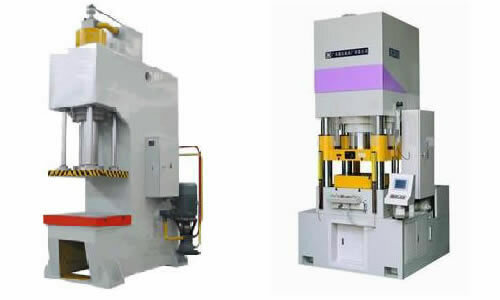 As a reliable C frame hydraulic press manufacturer and supplier in China, we not only produce metal processing equipment such as shearing machines, rolling machines, and hydraulic presses, but also manufacture petroleum equipment like oil drilling tools, solid control equipment, and more. Featuring reliable quality, stable performance and reasonable prices, our products are in sought after by customers around the world. Welcome to do business with Rugao Yaou Company!